Unfortunately President Obama’s “all-of-the-above” energy plan, while a catch phrase that seems inclusive, does not cover oil and natural gas production on about 95 percent of federal lands and is hostile to coal use. For example, federal waters opened to oil and natural gas production in 2008 by President Bush and Congress are not included in the President’s 2012 to 2017 offshore leasing plan. [ii] In practical terms, the Offshore Drilling Moratorium in place between 1981 and 2008 will remain in place until at least 2017 under the Obama Administration leasing plans. The Obama Administration also promotes offshore wind projects, though their cost has shown them to be prohibitive compared to other renewable projects. The Energy Information Administration estimates the cost of generation from offshore wind to be 2.5 times more expensive than generation from onshore wind, and 3.7 more expensive than natural gas-fired combined cycle generation. The governors of five states and 10 federal agencies and departments have signed a memorandum of understanding to boost development of offshore wind energy in the Great Lakes. The governors of Illinois, Michigan, Minnesota, New York and Pennsylvania co-signed the memorandum of understanding, which requires federal agencies to streamline and expedite their current regulatory regimes for offshore wind projects. The Energy Department, one of the federal signees, estimates that the Great Lakes has the potential to produce more than 700 gigawatts of energy from offshore wind, about a fifth of the total offshore wind energy potential for the United States. [ix] However, while the winds may be there, so is the higher cost of producing the electricity. While the Obama Administration is promoting all sorts of renewable technologies on public lands, fossil resource development on federal lands has fallen by the wayside. Oil production on federal and Indian lands has declined by 13 percent in fiscal year 2011 from fiscal year 2010 levels, while production on private and state lands has increased by 11 percent due to less bureaucratic red tape and the advent of hydraulic fracturing technology to get oil in shale formations. [x] Recent government impediments to oil production have included the denial of the Keystone XL pipeline, continued delays in Shell’s Arctic Alaska permits, and the moratorium and permitorium in the Gulf of Mexico after BP’s oil spill accident. The federal government leases less than 2.2 percent of federal offshore areas and less than 6 percent of federal onshore lands for oil and natural gas production. When oil and gasoline prices peaked in 2008, President Bush and Congress allowed access to additional federal lands for oil and gas exploration. 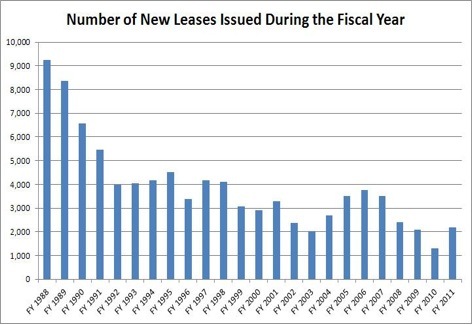 And, before leaving office, President Bush put forth a new 2010 to 2015 lease plan that included areas for leasing that had been off limits for almost 3 decades. The Obama Administration rejected that plan prior to the Macondo oil spill and since then has put forth delay after delay. The Department of Interior now claims that its delay is because of the oil spill, though the Obama Administration had rejected a perfectly good plan prior to the spill. Due to the delays imposed by the Obama Administration, for the first time since the United States has had a comprehensive offshore leasing program, the 5 year plan will not be submitted in time to meet its statutory deadline and give Congress its 60 day review period. The Obama administration did not hold a single offshore lease sale in fiscal year 2011, while the Bush administration planned to hold five. Those sales were rejected when the Obama Administration decided not to pursue the 2010 to 2015 outer continental shelf lease plan reflecting the expiration of the Presidential and Congressional moratoriums on leasing in 2008 demanded by the public. 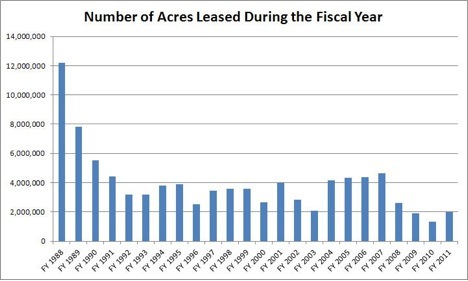 President Obama’s Bureau of Land Management is setting records for the least number of leases on average per year. For example, President Clinton’s Administration issued over twice the number of leases per year than President Obama’s Administration issued (1856 leases), even though oil and gasoline prices were substantially lower during the Clinton Administration than the Obama Administration. The Department of Interior has approved 27 projects for wind, solar, and geothermal electricity production since 2009 and 17 more are in review this year. In contrast, the Obama Administration has approved only half the leases per annum that the Clinton Administration approved and has taken the nation backward in its offshore leasing plan for 2012 to 2017, denying access to offshore areas opened for leasing by Congress and President Bush in 2008. In sum, the Obama Administration is force-feeding more expensive energy into the economy while starving Americans of the kinds of energy that they want to use. If Americans are concerned about energy costs, they should be concerned about these actions by the Obama Administration. There He Goes Again: Paul Krugman Invents Solyndra "Facts"